Well the post title says it all I guess. I'd like to have a method to add or edit reminders without having to mouse to the "reminder" button of the note, for ergonomic reasons. A dedicated keyboard shortcut would be great, but adding more reminder actions to the context menu would already help. I noticed "clear reminder" and "mark as done" are already there. I completly agree! I'm new to Evernote and have spent practically the last two days soaking up best practices, tips and tricks to fully utilize Evernote to its (and my) full potential. I'm a heavy note-taker, so the faster I can create and manipulate notes the better. Keyboard shortcuts are essential to cutting down time. I realize Evernote is succesful in part due to it's simplicity and ease of use (for such a robust platform), but adding some advanced keyboard shortcuts would be much appreciated for noteaholics like me! Thanks in advance, Evernote Team! I'm really surprised there isn't a keyboard shortcut. Mac users can't even create one. Why hasn't this been implemented for yeaaaaaaars despite feature requests? Anyone who uses Evernote more than occasionally (let's say, beyond clipping random pancake recipes) accesses the reminder function a dozen times a day. Reminders transform Evernote from a note pad into a project organisation tool. A shortcut would literally save me minutes every day. There must be some (technical? practical?) 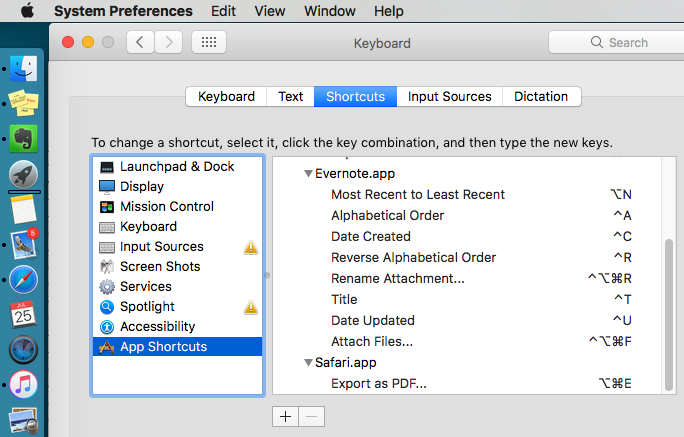 explanation (beyond lack of interest for the need power/premium users) behind Evernote's reluctance to create this shortcut – I think power users deserve at least a motivation. I agree, at least adding a menubar item so we can set up the hotkey ourselves (system preferences>keyboard>shortcuts) would be great. I process all my bills in Evernote and it's a pretty robust process, and I've gotten really good at using those shortcuts to get around. Shift+Cmd+I - To edit the note info. Change the created and updated dates. Assign tags here if I want. Cmd+' - If I want to handle notes from the note list. I feel like I've mastered these and it's nice being able to use over 90% of the app via keyboard.....and then there's reminders. You +1ers might think about up voting the request. The voting control is in the upper left corner of this discussion. Allright DTLow thanks for pointing that out. Agree with people above. Short hot keys for reminders will be of great improvement and time savers for my workflow. Now I am processing all my to do list through evernote application and enjoying a lot productivity. So, it would be great to have for example Ctrl + R to apply reminder and if we press Ctrl + R + 3 it will put reminder in 3 days. +1 and upvoted. I'm really surprised there isn't a keyboard shortcut. Mac users can't even create one. I agree on having a shortcut for reminders would be really nice. I'd also like to have the "remove date" in IOS version on the Mac version, i.e. keep the reminder, but remove the date. Unless I'm missing something (which is highly likely), I have to click the little clock icon twice in order to bring up the "Mark as done" option in the Reminders menu. That's annoying when I'm going through a well of completed articles I need to mark as such. Being able to batch-process the status of articles would be REALLY awesome, but I'd be happy at this point to just eliminate the second click, which ALSO brings up the one option that appears on the first click: Add a date. This first popup is a complete waste of time, but I can't find anything in the prefs where I can disable it. Yet another request for a necessary feature. I mean, how hard could it be to add a menu item on Mac so we can set a shortcut ourselves? Since this thread has been revived, I wanted to address this. The first click on the clock icon activates the reminder (note that the clock turns blue). If you don't select Add a Date at this point, then the note is added to the bottom of your reminder list without a date. The purpose of the second prompt is to allow you to deal with the reminder when the due date/time is reached. So the second Add a Date is there in case you want to push the due date/time on out. Evernote, I would like to add that I also want this feature. Please add more shortcut keys in general. Surely it can't be that hard to add more shortcut keys? Even keystroke access without a shortcut would be a big improvement. Right now, at least in the Windows app, there is no way to navigate to the Reminders function via keyboard. But a native shortcut or even keyboard access (which would simplify the scripting required of the user to create a shortcut) would be preferable. Please add more shortcut keys in general. I agree having shortcut keys to set reminder date and time would be helpful. also a way to batch tag and set/change reminder date and time is needed. I gave this thread a +1. It is highly disappointing that this feature hasn't been added. In fact, with the latest couple updates, they made it more difficult to access Reminders by moving it to the drop down arrow in the upper right. That means a minimum of 4 mouse clicks to set a reminder. GRRRRR!!!! I am a premium member that has been using the app since 2008. This obviously isn't a deal breaker for me, but I would use the app more and wear my EN t-shirt twice as many times per month if this were added. @Neyghey I believe there is still some work to do with the app, especially around the Reminders. I can't in good consciousness let your statement hang without my overall opinion of EN. I truly believe that EN is the best notes app ever created. I have used OneNote, Google Notes, and many other less known apps but the ease at which EN functions on mobile and desktop for just about anything I want to store and search for later is exceptional. There isn't a product on the market that comes even close! The best feature is the ability to copy the internal link so that you create an ecosystem of personal documentation. I LOVE this more than most software products designed to make life easier. Yes, I am an EN bandwagon fan! And yes, I would love to see continued improvements...especially the ones that get brought up in this forum! I truly believe that EN is the best notes app ever created. 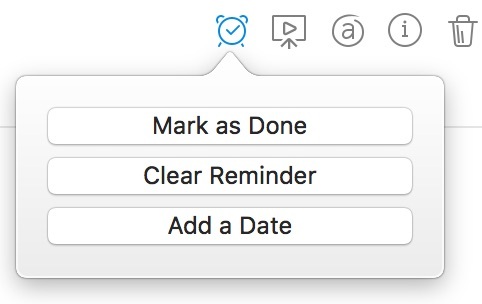 Someone with a Mac can confirm, but I think you can move the reminder icon out of the dropdown and onto the note header area. 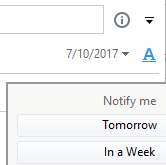 In Windows, I dragged the reminder icon out of the dropdown and now it sits next to a few other icons, all of which sit to the left of the dropdown icon. Clearly, keyboard access is still needed, but at least you won't have to make so many mouse clicks to set/adjust reminders. Someone with a Mac can confirm, but I think you can move the reminder icon out of the dropdown and onto the note header area. One click to set a reminder; additional clicks to assign a date. @Bushgang Don't get me wrong, i LOVE EN as well and i can't imagine my life without it anymore. (otherwise i would not even bother to participate in the forums) Been using it for over two years and my life has definitely become more organised. I am using the internal note link feature to create a kind of handbook-wiki for my company. LOVE IT!! Yes! I figured this out for Windows!! You click the dropdown, choose Customize, and drag the Reminder icon out to the toolbar. Not intuitive...and I wouldn't have even tried that if you hadn't said what you said. Thanks @tavor!!! You rock! Shortcut Keys.... especially to clear reminders... would save me quite a bit of wasted time. I right click on the task and select Clear from there but... being able to keep my hands on the keyboard and use short cuts when going through my lists would be VERY helpful. Been using EN for years and certainly will continue to do so... but adding the ability to add custom shortcuts...or even adding canned shortcuts for the obvious things would be GREAT! Shortcut Keys.... especially to clear reminders. Hey... thanks a lot for the quick reply DTLow! Very much appreciated... I will definitely check out Fastscripts. i am a video editor and have been using AMC (Avid Media Composer) for quite a while. For me, the thing that distinguished AMC from other editing apps for many years was its "keyboard GUI" feature. Recently Adobe Premiere Pro added the same feature, even better imo, it looks like this: https://helpx.adobe.com/premiere-pro/using/default-keyboard-shortcuts-cc.html . I think this could be worth an own thread, what do you think? I agree... As awesome as EN is... it would,... without a doubt, be SO much better with this functionality! but adding the ability to add custom shortcuts...or even adding canned shortcuts for the obvious things would be GREAT! +1 from me. And an upvote for the thread. 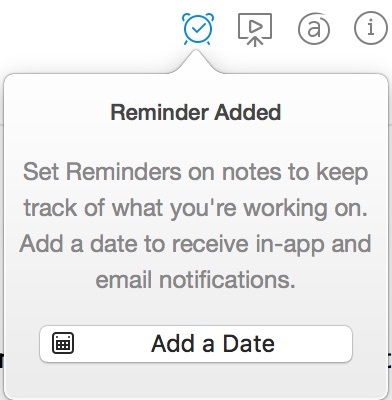 In general, I love this app, but the lack of a way to update the reminder field without a mouse is the #1 annoyance for this premium user. Here's a solution until an official update is released. Requirements: Mac + Alfred App with Alfred Powerpack. Download my workflow and it will enable a hot key that lets you modify one or many reminders at once. Thanks a lot. That improves things for me. I already use Alfred and has the Powerpack, so it was easy for me to get it running. I had to add the shortcut again, though - just for your information. Pending EN implementing this functionality I created my own hotkeys using PhraseExpress; Alt-1 to add/delete, Alt-2 to change date and Alt-3 to clear. Took about 20 minutes since I was using screen positions, but now just one combo key press for reminder maintenance. FWIW. The thing that helps me to live with this "reminder flaw" is that I use Cronofy sync to my Google calendar. This allows me to show Evernote reminders as normal calendar items and drag-n-drop them to move a reminder to another time. This works really good for me, and I can recommend it. Just google it. But of course this only work for existing reminders with a time and date set. I'm seeing it as a question of priorities for development work. User votes is one of the factors Evernote uses in determining the priority. You're welcome to add your vote to the request. Voting buttons are in the top left corner of the discussion. Yeah, I voted a couple of years back on this thread – hence my new post today (a reminder of sorts). I don't understand though how a 15min developer job to create a shortcut is of lesser priority since it is consistently within the top 10 most upvoted feature requests? I wasn't aware of the work estimate. Is this all platforms, or just the Mac platform?